Obamacare was self-destructing the day before Donald Trump was elected, and the Republican victory, with their talk of "repeal and replace," has only accelerated things. Aetna's CEO recently said that the Obamacare insurance exchanges are in a "death spiral." Cynthia Cox, of the "non-partisan" Kaiser Family Foundation responded that the insurance exchanges "are not really in a death spiral yet." She would know more than the Aetna CEO whose company lost $450 million in the Obamacare individual market last year. I have avoided the term "death spiral" because it has become an overly politicized term most often used by people who don't really understand it. A "death spiral" is a technical term that comes from the days when carriers could underwrite risk and exclude sick people from their programs and is analogous to the process of an airplane climbing to a high altitude, losing control, and, being unable to regain lift, spiraling down to the ground. Until the block crashed and had to be abandoned. But, some of the analogy does apply to the Obamacare insurance exchanges. The following chart shows the percentage of subsidy eligible people who signed up for coverage in the first year––2014––broken down by their income as a percentage of the federal poverty level (FPL). Remember, insurance companies ideally want to see 75% of an eligible group sign up in order to have enough healthy people paying premium to pay for the sick. 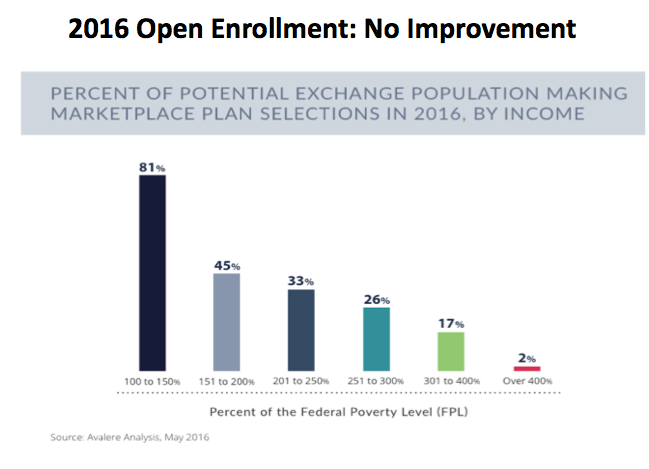 For 2017, the Obamacare exchange enrollment was flat on a national basis––so this picture hasn't gotten any better or any worse since the 2016 election. 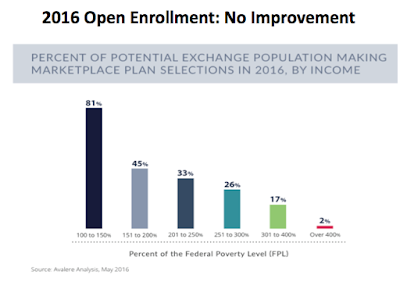 The Obamacare insurance exchanges started out in 2014 with an enrollment for the poorest––100% to 150% of the federal poverty level––in great shape with 76% of the eligible signing up and growing to 81% in 2016, attributable to the lowest premiums and out-of-pocket costs these people are eligible for. This little corner of Obamacare is a healthy and sustainable block of business. But between 151% and 400% of the FPL, only about 30% of the eligible signed up in 2014 and that number hardly budged by 2016––the exchange enrollment in these brackets never approached a sustainable level. What Kaiser's Ms. Cox doesn't understand about this block is that it never gained altitude in the first place in order to come spiraling down! So, I guess she is technically right to say this isn't a death spiral. I am reminded of this February 2014 Politico headline describing the first open enrollment: "Obamacare finally clears the tower." Actually, Obamacare never cleared the tower much less gained enough altitude to come spiraling down! When the Obamacare exchanges launched in 2014, the first year enrollment already looked like the end of a death spiral. Any new block that only signed up 30% of the eligible would have been immediately shut down as a failure if a single insurance company had operated it. Ms. Cox also said, "there isn't evidence that the pool of people is getting sicker." Ms. Cox, with only 30% of the eligible ever signing up between 151% and 400% of the FPL, this block was already about as sick as it could get! You can fault the Republicans for adding fuel to the already burning Obamacare fire, but you can't claim this program was sustainable before November 8th, 2016. But even this analysis misses the other half of the market. 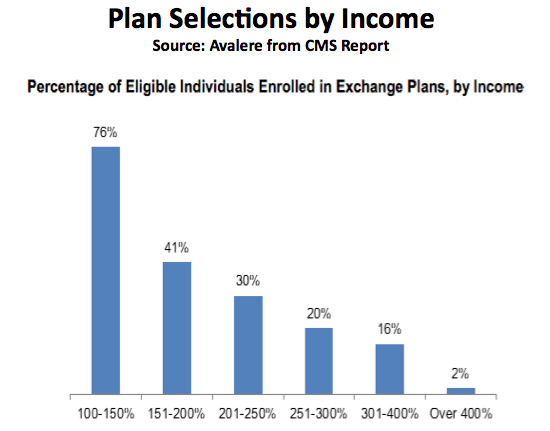 In 2016, virtually half of the market was purchased off of the exchanges––Obamacare compliant on and off exchange plans all have to be designed and rated the same. We have seen the disastrous carrier by carrier 2015 results from the federal reinsurance program that included both off-exchange and on-exchange business. We also know the off-exchange results were bad enough to produce the big 2017 rate increases. And, we do know that these off-exchange people don't get a subsidy and have to pay the full price these big rate increases developed for 2017. The easy prediction is to say that those increases have to be pushing a lot of healthy people, who don't now use their insurance, off of their coverage. I can tell you that I have talked to a number of health plans that are telling me that when the big rate increases became effective on January 1, 2017, their off-exchange net enrollment shrunk between 15% and 35%. The carriers are also telling me that their off exchange medical loss ratios are just as bad as the on-exchange business. And, the Aetna CEO certainly knew about the medical loss ratio on his off-exchange block when he made his comments. We won't know if 2017's big off-exchange cancellations are part of a death spiral in this half of Obamacare until we see a few years of data and can look back at the complete picture. But this does have all of the classic characteristics of a spiral––big rate increases pushing the people who don't need heath insurance this year off the program leaving the sick people who do need it in a program where those quitting now can be guaranteed of coming back next January if they get sick. Much is being made about all of the voters protesting that they do not want to lose their Obamacare health insurance plans. The protests are understandable. If one of my kids was dependent upon the program I might be right there with them. We currently have millions of people who need this insurance and many millions who need the subsidies to keep it. But here is the fallacy in their protests: Obamacare is failing right now. It is an illusion to think we can keep what we were promised when it launched. How many states will not have a carrier in 2018? How many markets will have only one choice? How many states will see their Blue Cross plan remain––most of the for-profits are already gone––but with another round of big rate increases pushing still more unsubsidized consumers out of the program? Those that frame this debate as the simple binary choice of either keeping these people covered under the current plan with minor changes or letting the Republicans kill it are doing everyone a disservice. The Republicans will never have the votes to pass their least conservative version of "replace," much less the hard line proposals coming from the most conservative members, and they will ultimately have to work with Democrats to fix it. The Democrats can't just keep defending a failed program by misleading people into thinking that Obamacare is fundamentally sustainable and can be kept––this thing is in the process of self-destructing and they will ultimately have to admit that and work with Republicans to fundamentally fix it. Obamacare must be fixed in 2017. Today we have almost 20 million people in the Obamacare compliant individual health insurance market that now depend on a program in self-destruct mode. At the end of the day, both Democrats and Republicans will have no other alternative but to fix it. 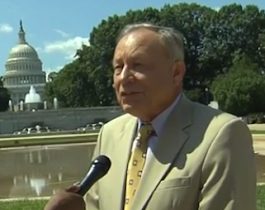 My CNBC op-ed on how Obamacare could be fixed.